There are ways to broaden your knowledge and fuel curiosity simply by reading fiction. While it isn’t a substitute for research, little gems of knowledge and inspiration for further research can come in the midst of a fictional story that transports and entertains. Breena Clarke creates the fictional town of Russel’s Knob New Jersey: a gathering place for those running from the slavery and oppression of the pre-civil war south, a community comprised of people who are more tolerant and less inclined to follow societal norms. Character driven, with events that range from heartwarming to heartwrenching, Clarke’s portrayals of the people we meet, and most especially Dossie, are fully living and breathing. Completely perfect in their imperfections, their traits and predilections, prejudices and hopes are clearly displayed and ad a fullness to the reader’s experience. While you don’t need this book to explain the complexities of human nature: good or bad, Clarke doesn’t hold back in presenting all sides in clear and evocative imagery. Narration for this story is presented by Love Carter and her delivery and performance were the perfect accompaniment to the story: never over-reaching for emotional impact, nor underplaying the moments of horror to spare the listener. Clear enunciation, smooth and steady delivery and high quality production values all lead to a pleasant experience. While I was excited about this book, I was completely unprepared for my reactions to it when I finished. This is one of those stories that stays with you, long after the end. While there is love and hope, there is murder, violence and betrayals here: highlighting the fact that people, even 150+ years ago, weren’t all that different from today. 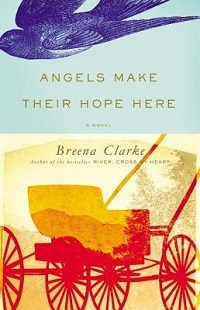 Breena Clarke's third novel, ANGELS MAKE THEIR HOPE HERE, will be published in July, 2014. Breena is the author of two historical novels set in the Georgetown neighborhood of Washington, D.C. Her debut novel, RIVER, CROSS MY HEART (1999) was an October 1999 Oprah Book Club selection. Clarke’s critically reviewed second novel, STAND THE STORM is set in mid-19th century Washington, D.C. and was chosen by the Washington Post Book Review as one of 100 best for 2008. Breena Clarke is co-author with Glenda Dickerson of the play "Re/Membering Aunt Jemima: A Menstrual Show" and is an advisor to the board of A Room Of Her Own Foundation. She is on the fiction faculty of The Stonecoast MFA program at The University of Southern Maine.